The VIIRS global land surface phenology (GLSP) product aims for a science quality data standard that will enable continuity of a key Earth system data record from the VIIRS time series. This product provides consistent spatial and temporal estimates of the timing and magnitude of phenological development of the vegetated land surface across the globe, that is suitable for characterizing and understanding interannual-to-decadal scale changes in ecosystem responses to changes in the environment. The VIIRS Collection 1 (C1) GLSP product (VNP12Q2), at a spatial resolution of 500m, is produced using an algorithm refined from the Collection 5 MODIS product, which contains twelve phenological metrics (seven phenological dates and five phenological magnitudes), along with six quality assurance metrics characterizing the confidence of phenology retrievals for each pixel. The six phenophase transition dates in the VIIRS GLSP product are closely comparable to PhenoCam observations (Zhang et al., 2018a) and Landsat detections (30m) with a mean absolute difference of less than 10 days (Zhang et al., 2018b). 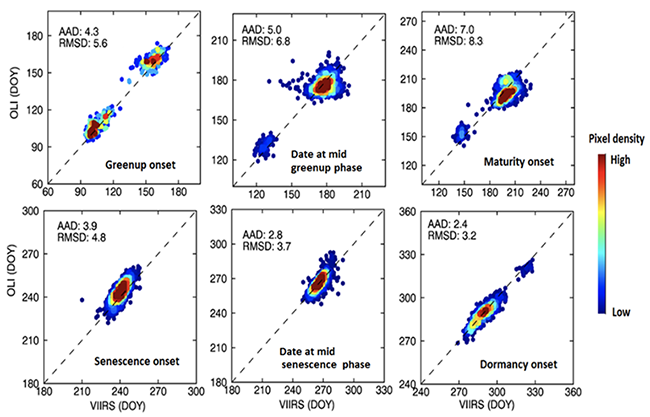 where t is time in the day of year (DOY), a is related to the vegetation growth time, b is associated with the rate of plant leaf development, c is the amplitude of EVI2 variation, d is the vegetation stress factor, and EVI2b is the background value. This model is used to retrieve all the GLSP metrics on an annual basis. Evaluation of VIIRS GLSP (500m) using fused MODIS-Landsat OLI detections (30m) in 2013 in the central US. AAD is average absolute difference and RMSD is root mean square difference (both units are days). In situ observations of leaf phenology US-NPN. Time series of near surface vegetation indices from the PhenoCam network. This network currently includes about 300 sites distributed across North America. Cross-sensor comparisons using LSP results from Landsat available in NASA MEaSUREs Web Enabled Landsat Data (WELD) product. Cross-sensor comparisons between MODIS and VIIRS phenology for 2013-2015. Zhang, X., Jayavelu, S., Liu, L., Friedl, M.A., Henebry, G.M., Liu, Y., Schaaf, C.B., Richardson, A.D., and Gray, J. (2018a). Evaluation of Land Surface Phenology from VIIRS Data using Time Series of PhenoCam Imagery. Agricultural and Forest Meteorology, Vol. 256–257, pp. 137-149. https://doi.org/10.1016/j.agrformet.2018.03.003. Zhang, X., Liu, L., Liu, Y., Jayavelu, S., Wang, J., Moon, M., Henebry, G.M., Friedl, M.A., Schaaf, C.B. (2018b). Generation and evaluation of the VIIRS land surface phenology product. Remote Sensing of Environment, 216, 212-229. https://doi.org/10.1016/j.rse.2018.06.047.